You don’t have to go swimming in the ocean to have your very own shark encounter. 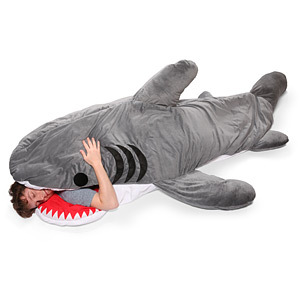 Just hop in the Chumbuddy sleeping bag and enjoy sweet dreams of being devoured whole. Sharks have been in the news a lot this summer in New England, especially on Cape Cod. There have been several great white shark sightings in Chatham and then there was that widely distributed Jaws-esque photo of a large shark pursuing a kayaker on Nauset Beach. If you’ve ever considered what Quint’s final thoughts were as he was chomped by the shark in Jaws, here’s your opportunity to find out. Alternatively, if you’d rather sleep in the belly of a different beast, you may also consider Thinkgeek’s Star Wars Tauntaun sleeping bag ($149), which replicates the Luke Skywalker experience on Hoth.